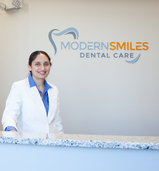 Modern Smiles Dental Care is a dental practice in Burlington MA that treats both children and adults. Dr. Sarita Malhotra a Invisalign dentist offers patients the dental care and smiles they dreamed about because she loves to see you smile. Modern Smiles Dental Care dentists have patient-friendly philosophy, which focuses on cosmetic and restorative dentistry, affordability and a commitment to total dental oral health.